Make this One Pan Spiced Chicken and Rice Recipe on busy days when you are craving a flavorful but comforting dish after a long day at work. Easy mouthwatering and only 15-minute weeknight meal for two. I always believed that rice and chicken are meant to be! These two ingredients go hand in hand and you can make so many different version of flavorful dishes with just chicken and rice as main ingredients. In fact there are couple of reasons why chicken and rice make a great weeknight dinner meal on busy days. the rice acts like a blanket around the chicken which keeps the meat moist and tender. the aroma of the dish smells divine in the whole house! I pepped it up by adding Indian spices to enhance the aroma of the chicken and rice. You are going to love it! This chicken and rice is a yellow rice complete meal dish. So even if you make more and you have leftover, you can enjoy the next day round too by warming it up again. I tend to stir fry the chicken and rice if there has been a left over, as this gives the dish another flavor edge. How to make Chicken and Rice? This chicken and rice recipe is flavorfully enhanced with spices, yet it is not hot in terms of chili heat. So it’s suitable for a family with kids. 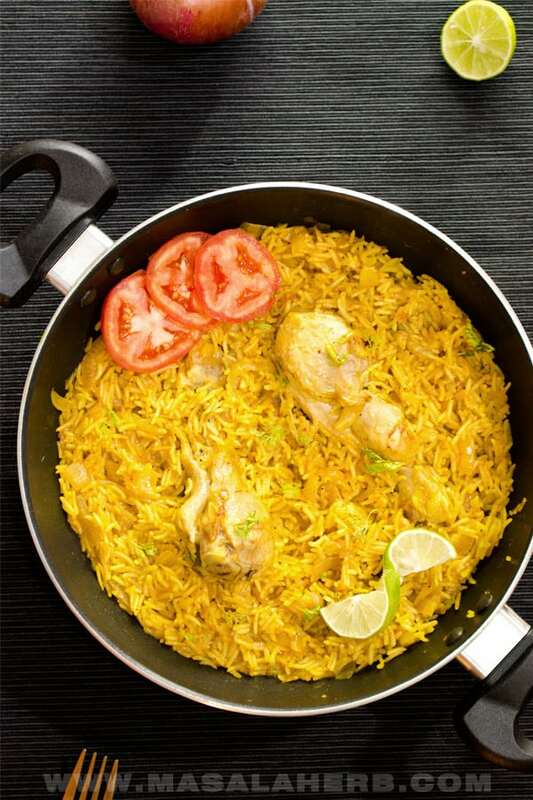 To make this yellow one-pot chicken and rice from scratch, you will need rice and chicken as main ingredients and a couple of spices as well as butter, tomato paste and vegetable stock or water mixed with a Maggi cube. 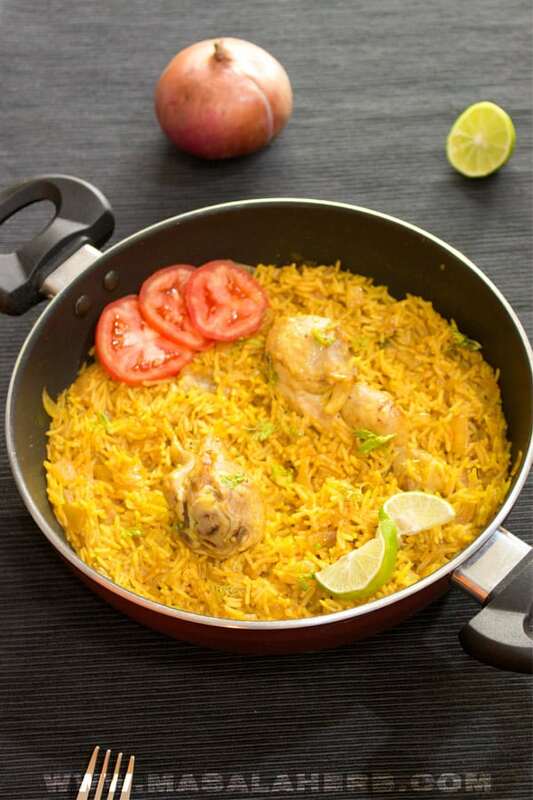 For the Rice, pick Basmati rice as it has a lovely aromatic touch to it, which goes well with the chicken in this dish. For the Chicken, pick meat with bone. Boneless chicken meat tends to over cook and get tough in this dish and doesn’t lend the dish the desired end result flavor. In that case pick Chicken drumsticks as you can easily pick the drumsticks out of the rice to eat. To cook this one-pot dish I recommend you using a cooking pot utensil such as a Chinese Wok, an Indian Kadai pan or an all-purpose pan such as this one here. I recommend using these pans because, the heat is spread out evenly while cooking the dish and you tend to save time cooking this way. 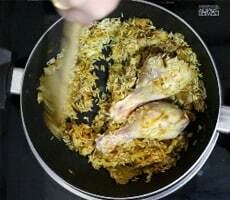 The steps to prepare the one-pot chicken and rice are simple, as you can easily see in the video. 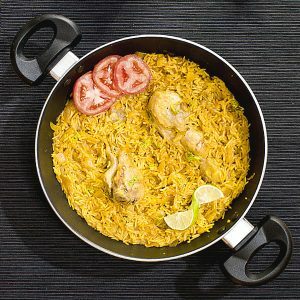 Make the flavorful aromatic one-pan chicken and rice as a weeknight meal for two on busy days or when you are exhausted after a long day at work, and at the same time when you are looking for a home-cooked, from scratch, a meal that comes together in less than 15 minutes. Completely hassle-free, suitable also for beginner cooks. In a shallow big pan add the butter and stir fry the spices, bay leaf, black pepper, cinnamon, turmeric, chili, coriander and cumin for a minute. Then add the sliced onion and continue stir-frying until they get a bit soft. Throw in the cloves and garam masala and add the ginger garlic paste and tomato paste as well and stir fry for a minute. Then add in the veg stock and some salt to taste. 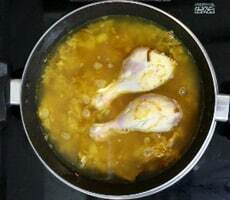 Mix the content well and let cook on slow heat covered for about 10-15 minutes or until the rice is cooked fully and the chicken is well cooked and tender. Serve hot if you want with some garnish such as fresh cilantro. 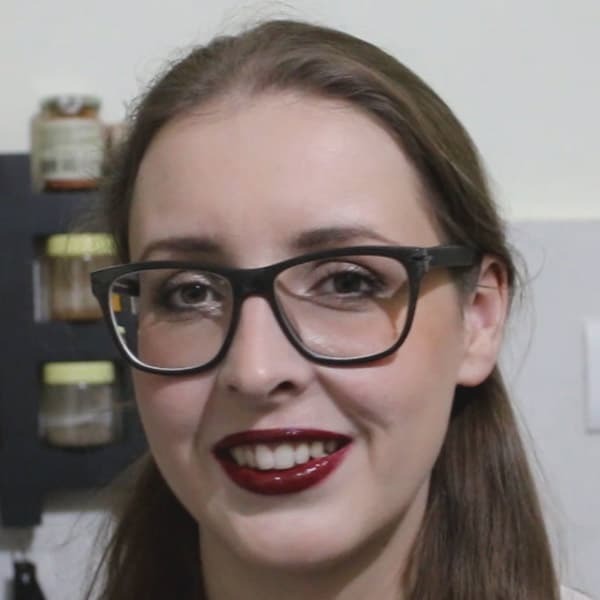 Tip: Watch the 1 minute Recipe Video in the post, above the recipe card. Dear Reader, did you try to modify this one-pot chicken and rice recipe? What was your food discovery, share it with us in the comments below! I am a fan of quick one pot meals. This looks really tasty! I love the sound of this, your photos are so helpful too, saving this for later! This rice is such a pretty color. It looks so flavorful and comforting. Great recipe! 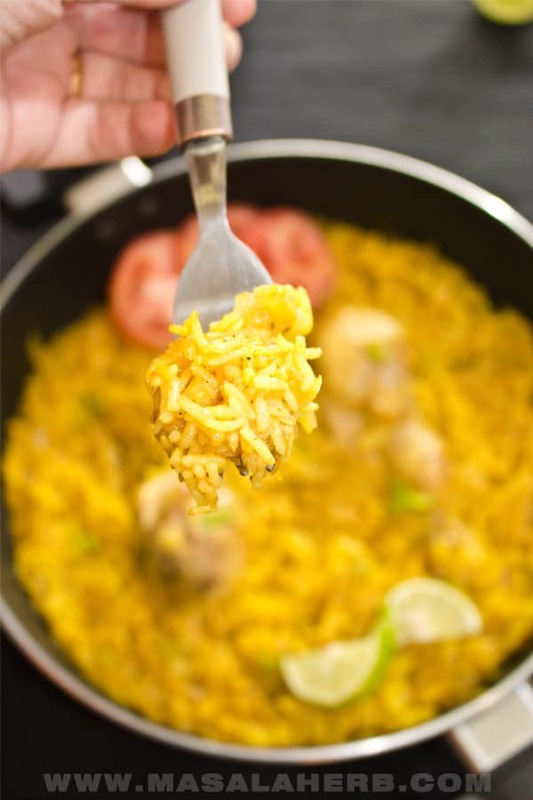 Yellow rice is always a hit in my house, so I can’t wait to try this! It’s a bit of a different spice blend but sounds just so tasty! Nigeria, where I come from there’s a similar rice that is famously called Jollof rice. It’s almost made this way but with little variation like frying the chicken in hot oil. Thanks for this new recipe. The vegetarian version of this would be Dal Khichadi – one pot rice and lentil dish. I was surprised that recently it was pitched as the national dish of India. Although all of us in India eat it, especially when one is not well, but pretty much no one really likes it. It is often called the ‘sick person diet’. Can you replace the chicken with some vegetables and still have the same recipe? I love the chicken and rice dish, it sounds amazing! I am all for quick one pot meals when I have to work. This looks like it would be so hearty and warming on a cold winter night! OMG! this One-Pot Chicken and Rice look tempting and yummy. Will definitely try this recipe for my family and they will love this for sure. I love meals that are simple but with lots of flavor. This looks like one I would love! YUM!!! this looks soo good! I could eat the whole thing! One pot meals are my favorite for several reason, The eas of them, the lack of dishes and the usually cook relatively quickly. Being a mother of 4 and two of them being in sports I’m always looking for quick and healthy. I’m going to add this to my folder on of one pot meals because it looks tasty. Chicken and rice is such a classic combination and the spices in this recipe really stand out! Lovely dish. Chicken and rice is both mine and my kid’s favorite meal, they can have it any time of the day. This recipe sounds so good and looks delicious, I am going to try this out. Pinned to my ‘one pan’ meals board! Love it! I love one pot meals… such a life-saver for weeknights! This looks so flavorful. I’m definitely adding this to my dinner plan this week. I just found some frozen chicken drumsticks I had forgotten about in my freezer and wasn’t sure what I was going to do with them, so this is perfect timing! This sounds and looks delicious. I will defo be trying this one day. This looks absolutely delicious! I love rice and you can do so much with it! I just left work and I am super hungry so I might give this recipe a go tonight! I am sure it will taste delicious. Since I am a vegetarian, I will try making it with either veggies or paneer ( a kind of cheese). I love rice dishes. I am not big on chicken or meat for that matter but my husband would love this. Will go in my Pinterest board of dishes to try. I was raised on chicken and rice (arroz con pollo) in Panamå and I have to say I love the combination of flavors in your dish! Thanks for sharing a great recipe! I can’t wait to try it. This dish is something I’d LOVE to try! I love one pot meals, and rice/chicken area always an easy favorite. We really like Basmati rice, too. It’s so aromatic and cooks up wonderfully. That looks easy, simple yet filled with flavors and just delicious. I am going to be trying this recipe tomorrow. This looks like such a great family dinner night. I love that it’s one pot. This looks delicious! I’m pretty sure that my family would love it! It would be perfect for our dinner this coming weekend! If there was a perfect couple in the world of food, that would be chicken and rice, that’s for sure! The recipe is awesome and it reminds of some good times I had a few years ago travelling. Thank you very much for sharing it! This sounds like a very yummy and easy recipe to make. I never thought of adding the chicken in the same pot as the rice and then use spices to flavour it. I might do this on the evenings when I go to the gym and I am not in the mood to cook for a long time when I come back. Being vegetarian I will not be able to cook and taste this recipe but certainly my non veg friends will relish lot. Making it tomorrow! 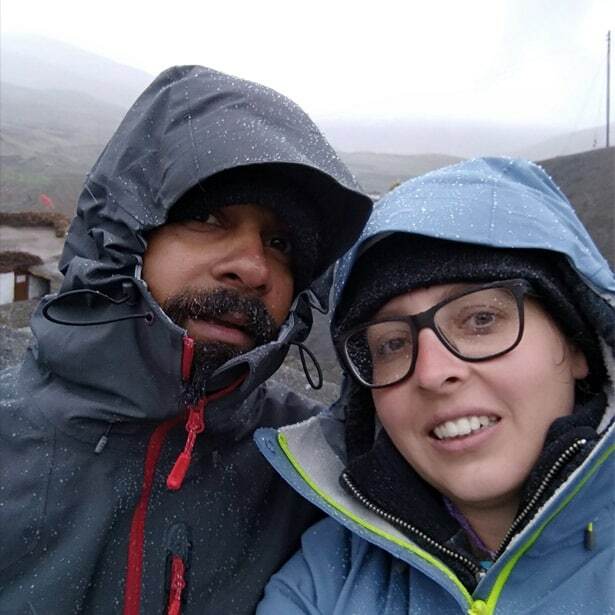 :))) Thanks for sharing it so on time for me – just a recipe I needed. I am never good when it comes to cooking, but this looks like something I could easily learn! Thanks for this great idea. This looks delicious and so easy to make! I need to try making this! 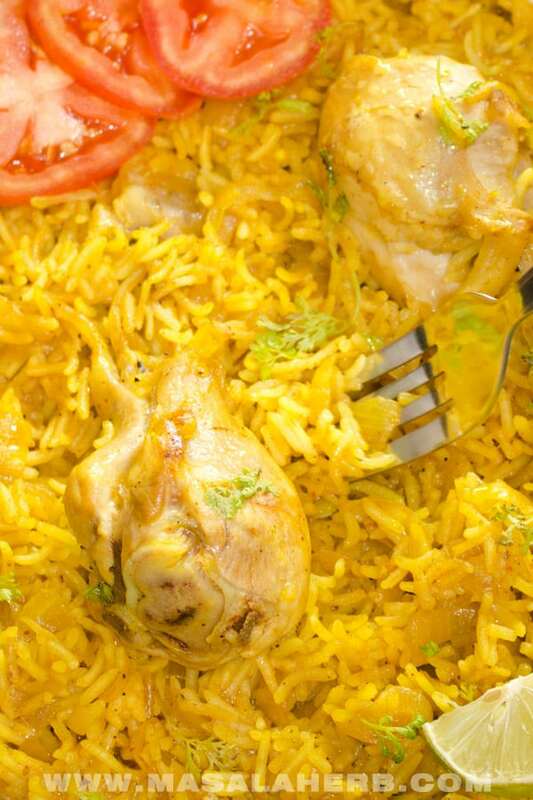 This chicken and rice recipe reminds me of Indian recipe known as ‘Biryani’. It looks incredibly delicious and easy to make! Love your photo’s this looks yum yum. One pot meals are so warm and easy during the cold times of the year. This one pot chicken and rice recipe look delicious and easy to prepare. I will definitely try this recipe for our dinner. You know, I can not cook rice, it’s just can’t seem to master it. Oh, but how I love eating it. This right here might be my saving grace – definitely going to give it a try. OMG this looks so good. If people would only try making quick, delicious food like this….takeout restaurants would be out of business. Perfect for all the busy weeknights. I love all the spices used in this recipe. It looks delicious and nice and easy to prepare! My husband loves chicken and rice dishes. The interesting combination of herbs and spices here will be a new flavor sensation! And the ease of preparation is a definite plus! I agree. Chicken and rice are meant to go together. This recipe is looks amazing, and I love that it is made in one pan. I think it’s amazing how the process of browning the spices before adding the other ingredients intensifies the flavors. In my home, growing up, we never did this, but an Indian neighbor showed me how, and I love it. Oh one pot meals are my fav!Cant tell you how much i live on them.recipe is perfect! I’m always looking for a quick week night recipe. This one is different and looks easy! I make this biryani quite often, with lots of herbs and enjoy it with plain yogurt. This looks so good – I have always wanted to make it! I always love a one pot meal, especially when it only takes 20 minutes. Chicken and rice are always perfect together, and this dish sounds so flavorful with the seasonings that you used. I looooooooove chicken and rice. It’s was a regular recipe in my home growing up but using other flavors.I really would love to try it using the flavors in your recipe. It sounds delicious! Wow this looks delicious! I love one pot meals, so easy for weeknight dinners. This would make a delicious dinner for a busy school night. Love this! Such a great recipe for weeknight dinners. Especially love that it’s a one-pot recipe! That is a tasty, simple, quick recipe to make on weekdays. Although I am vegetarian, I would make it for my family and they would all love it! I **need** more one-pot recipes in my life. Thanks for sharing! Hi, this may be interesting you: One Pan Spiced Chicken and Rice Recipe!